There is nothing wrong with your television set. Do not attempt to adjust the picture. We are controlling transmission. If we wish to make it louder, we will bring up the volume. If we wish to make is softer, we will tune it to a whisper. We will control the horizontal. We will control the vertical. We can roll the image, make it flutter. We can change the focus to a soft blur, or sharpen it to crystal clarity. For the next hour, sit quietly and we will control all that you see and hear. We repeat, there is nothing wrong with your television set. You are about to participate in a great adventure. You are about to experience the awe and mystery which reaches from the inner mind to . . . The Galaxy Being (Series debut 9/16/63) Cast: Cliff Robertson, Lee Philips, Jacqueline Scott, Burt Metcalfe and William O. Douglas as "The Galaxy Being"; written and directed by Leslie Stevens Control voice (Vic Perrin): "The planet Earth is a speck of dust - remote and alone in the void. There are powers in the universe inscrutible and profound. Fear cannot save us. Rage cannot help us. We must see the stranger in a new light - the light of understanding. And to achieve this, we must begin to understand ourselves, and each other." The Hundred Days of the Dragon Cast: Sidney Blackmer, Phillip Pine, Mark Roberts and Nancy Rennick; written by Allan Balter and Robert Mintz; directed by Byron Haskin [Open] "Somewhere south of the Mongolian border and north of the Tropic of Cancer in that part of the world we call the Orient, a slumbering giant has shaken itself to wakefulness. Passed over in most histories as a nation forgotten by time, it's close-packed millions in the short span of 20 years have been stirred to a fury by one man: Li Chin-Sung. A benevolent despot in is homeland, Sung stands as an irresponsible threat to peace in the eyes of the rest of the world." [Close] "To Theodore Pearson (Pine), not even so monstrous a crime as the assassination of William Lyons Selby (Blackmer) justifies an act of war. Because there is no war as we knew it, only annihilation. A great American has been killed in the service of his country. Now, it is the job of those who continue to serve to carry on, guarding our freedom with dignity and unrelenting vigilance." The Architects of Fear Cast: Robert Culp, Geraldine Brooks, Leonard Stone and Martin Wolfson; written by Meyer Dolinsky; directed by Byron Haskin [Open] "Is this is the day? Is this the beginning of the end? There is no time to wonder, no time to ask, 'Why is it happening?' 'Why is it finally happening?' There is time only for fear, for the piercing pain of panic. Do we pray? Or do we merely run now and pray later? Will there be a later? Or is this the day?" [Close] "Scarecrows and magic and other fatal fears do not bring people closer together. There is no magic substitute for soft caring and hard work; for self-respect and mutual love. If we can learn this from the mistake these frightened men made, then their mistake will not have been merely grotesque. It will have been at least a lesson - a lesson at last to be learned." The Man With the Power Cast: Donald Pleasance, Priscilla Morrill, Fred Beir, Frank Maxwell and John Marley; written by Jerome Ross; directed by Laslo Benedek [Open] "In the course of centuries, man has devoured the Earth itself. The machine age has dried up the seas of oil. Industry has consumed the heartlands of coal. The atomic age has plundered the rare elements - uranium, cobalt, plutonium - leaving behind worthless deposits of lead and ashes. Starvation is at hand. Only here in the void of space is there a new source of atomic power. Above us in the debris of the solar system in the meteorites and asteroids are the materials needed to drive the reactors. Yet in their distant, silent orbits, these chunks of matter are beyond the reach of man, beyond the reach of human hands, but not beyond the reach of the human mind." [Close] "Deep behind the kindest, gentlest soul may lurk violent thoughts, deadly wishes. Someday men may learn how to cope with the monsters of the mind. Then and only then when the human mind is truly in control of itself, can we begin to utilize the great and hidden powers of the universe." The Sixth Finger Cast: David McCallum, Jill Haworth and Edward Mulhare; written by Ellis St. Joseph; directed by James Goldstone [Open] "Where are we going? Life, the timeless, mysterious gift, is still evolving. What wonders or terrors does evolution hold in store for us in the next 10,000 years? In a million?? In six million??? Perhaps the answer lies in this old house, in this old and misty valley." [Close] "An experiment too soon, too swift. And yet may we not still hope to discover a method by which within one generation, the whole human race could be rendered intelligent; beyond hatred or revenge or the desire for power. Is that not after all, the ultimate goal of evolution?" The Man Who Was Never Born Cast: Martin Landau and Shirley Knight; written by Anthony Lawrence; directed by Leonard Horn [Open] "Here in the bright clustered loneliness of the billion, billion stars, loneliness can be an exciting, voluntary thing, unlike the loneliness man suffers on Earth. Here, deep in the starry nowhere, a man can be as one with space and time; preoccupied, yet not indifferent; anxious, and yet at peace." [Close] "It is said that if you move a single pebble on the beach, you set up a different pattern; and everything in the world is changed. It can also be said that love can change the future. If is deep enough, true enough and selfless enough, it can prevent a war... prohibit a plague... keep the whole world whole." O.B.I.T. Cast: Peter Breck, Jeff Corey, Joanne Gilbert, Alan Baxter and Harry Townes; written by Meyer Dolinsky; directed by Gerd Oswald [Open] "In this room, 24 hours a day, seven days a week, security personnel at the Defense Department's Cypress Hills Research Center keep constant watch on its scientists through O.B.I.T., a mysterious electronic device whose very existence was carefully kept from the public at-large. And so it would have remain, but for the facts which you are about to witness." [Close] "Agents of the Justice Department are rounding up the machines now. But these machines, these inventions of another planet, have been cunningly conceived to play on our most mortal weakness. In the last analysis, dear friends, whether O.B.I.T. lives up to its name or not, will depend on you." The Human Factor Cast: Gary Merrill, Sally Kellerman and Harry Guardino; written by David Duncan; directed by Abner Biberman [Open] "In Northern Greenland, the mountains stand like a wall along Victoria Channel, whose straight course marks the line of a great fault. Until recently, not even the Eskimos ventured into this Arctic waste. But today as in other lonely places of the world, the land is dominated by those instruments of detection which stand as a grim reminder of man's fear of man. This is Point Tabu, a name given this predominently underground base by a young officer who explained that the letters in ''TABU'' stood for ''Total Abandonment of Better Understanding.'' Some 200 men and a few women make this their permanent residence. Their task is to maintain a constant alert against enemy attack, and be prepared to respond to it devastatingly." [Close] "A weapon? No, only an instrument, neither good nor evil until men put it to use. And then like so many of man's inventions, it can be used either to save lives or destroy them; to make men sane or to drive them mad; to increase human understanding or to betray it. But it will be men who make the choice. By itself, the instrument is nothing until you add the human factor." Corpus Earthling Cast: Robert Culp and Salome Jens; teleplay by Orin Borsten, story by Louis Charbonneau; directed by Gerd Oswald [Open] "Rocks - Silent, inanimate objects torn from the Earth's ancient crust, yielding up to man over the long centuries all that is known of the planet on which we live. Withholding from man forever, their vailed secrets of the nature of matter and cosmic catastrophe; the secrets of other worlds in the vastness of the universe, of other forms of life, of strange organisms beyond the imagination of man." [Close] "Two black crystalline rocks. Unclassifiable. Objects on the border between the living and the non-living; a reminder of the thin line that seperates the animate from the inanimate. Something to ponder on; something to stay the hand when it reaches out innocently for the whitened pebble, the veined stone, the dead unmoving rocks of our planet." Nightmare Cast: James Shigeta, Ed Nelson, Martin Sheen, Bill Gunn and David Frankham; written by Joseph Stefano; directed by John Erman [Open] "A war between worlds has long been dreaded. Throughout recent history, man, convinced that life on other planets would be as anxious and beligerant as life on his own, has bravely predicted that some dreadful form of combat would inevitably take place between our world and that of someone else. And man was right. To the eternal credit of the peoples of this planet Earth, history shall be able to proclaim loudly and justly, that in this war between unified Earth and the planet Ebban, Ebban struck first. Ebban... Its form of life unknown, its way of life unpredictable. To the fighting troops of Earth, a black question mark at the end of a dark, forboding journey." [Close] "The exploration of human behavior under simulated conditions of stress is a commonplace component of the machinery called war. So long as man anticipates and prepares for combat, be it with neighboring nations or with our neighbors in space, these unreal games must be played. And there are only real men to play them. According to established military procedure, the results of the Ebban maneuvers will be recorded in books and fed into computers for the edification and enlightenment of all the strategists of the future. Perhaps they will learn something." It Crawled Out of the Woodwork Cast: Scott Marlowe, Edward Asner, Kent Smith, Barbara Luna and Michael Forest; written by Joseph Stefano; directed by Gerd Oswald [Open] "His name is Warren Edgar Morley. For the past six months, he has guarded this gate from eight in the morning until six at night, at which time, he is replaced by another just like himself. These are the last few moments of his life..." [Close] "The conservation of energy law, the principle which states that energy can be changed in form, but that it cannot be either created or destroyed. And this is true of all energy. The energy of genius, of madness, of the heart, of the atom. And so it must be lived with. It must be controlled, channelled for good, held isolated from evil; and somehow, lived with peacively"
The Borderland Cast: Philip Abbott, Gladys Cooper, Nina Foch, Barry Jones, Gene Raymond, Mark Richman and Alfred Ryder; written and directed by Leslie Stevens [Open] "The mind of man has always longed to know what lies beyond the world we live in. Explorers have ventured into the deeps and the heights. Of these explorers, some are scientists, some are mystics; each is driven by a different purpose. The one thing they share in common is a wish to cross the borderlands that lie beyond the outer limits." [Close] "There are worlds beyond and worlds within which the explorer must explore. But there is one power which seems to transcend space and time, life and death. It is a deeply human power which holds us safe and together, when all other forces combine to tear us apart. We call it ''the power of love.''" We now return control of your television set to you until next week at this same time when the control voice will take you to . . . 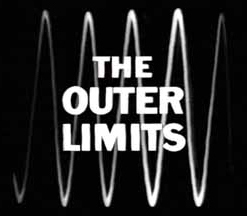 THE OUTER LIMITS: MGM site with downloads, station listings and other info. Content © 1963-65, Daystar-Villa Di Stefano - United Artists. All rights reserved.